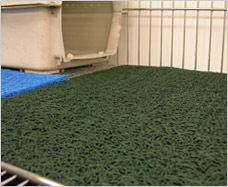 Are you looking for a soft, dry, odor-free flooring surface for your dog kennel? Look no further than PEM Dog Kennel Flooring! This cushioned and permeable surfacing creates a solid resting place for your canine companion. In addition, our kennel matting is treated with an antimicrobial formula, thus guarding against the growth of bacteria and fungi. Approved by Missouri Department of Agriculture for “Solid Resting Surface”. 100% Made in USA – Thermo Plastic Formula. PEM Antimicrobial formula to guard against the growth of bacteria. Low Maintenance – feces easy to remove and wash, ready to use over and over. Sweep, water wash-down or vacuum. Porous construction allows urine and water to pass through, keeping dogs dry. PEM offers three thicknesses for different weight dogs – Fluff, Light Weight and High Traffic. Fluff is used for whelping pens only. PEM is available in three widths: 2ft, 3ft and 6ft wide x 25’ long Rolls. Cuts easily with standard razor knife to custom fit any application. Can also be used for shade by attaching to pens using standard nylon ties. Lightweight and easy to handle. Recommended for kennels that house small to medium sized dogs or for runners & cleaning stations where daily cleaning may be necessary. Thicker construction allows for increased padding and durability. Recommended for large breed dogs and high traffic areas. "It has been a great 4 years testing your PEM in our Loeb-A-Rosa Kennel. I first used them in front of my sinks and grooming tables for my own comfort. The mats cut easily using a razor knife, so I could custom fit them in any place. When I started using the mats in the dog runs and bed areas, I found how easy they were to clean. Your mats allow urine and water to pass through, keeping the dogs dry. The feces was easy to remove, and the mats washed easy, for continual use. It was also nice to know your products have ANTIMICROBIAL in the formula to proctect against the growth of mold and bacteria. This is very important to me in my nursery to protect my newborn pups and mamas. I'm happy to know using your mats as a "Solid Resting Surface" for my dogs, keeps me in compliance with my Missouri State Inspectors. Thanks for a wonderful product!"